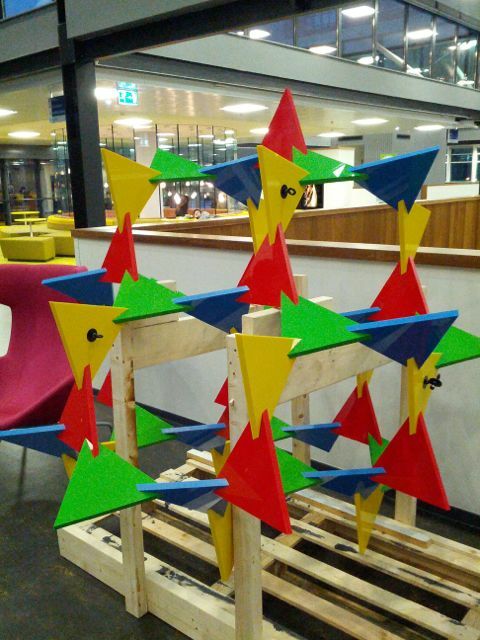 Bamboozle consists of 51 equilateral triangles, meeting pairwise at an angle of about 70.5 degrees (arccos 1/3). 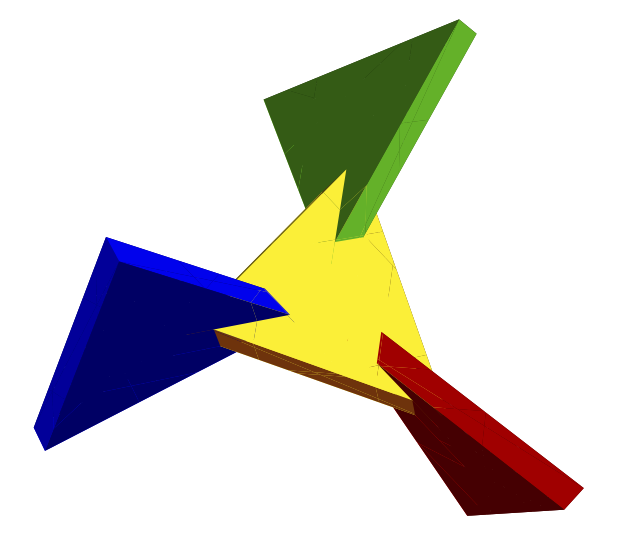 The four colors correspond to the four orientations of the triangles. 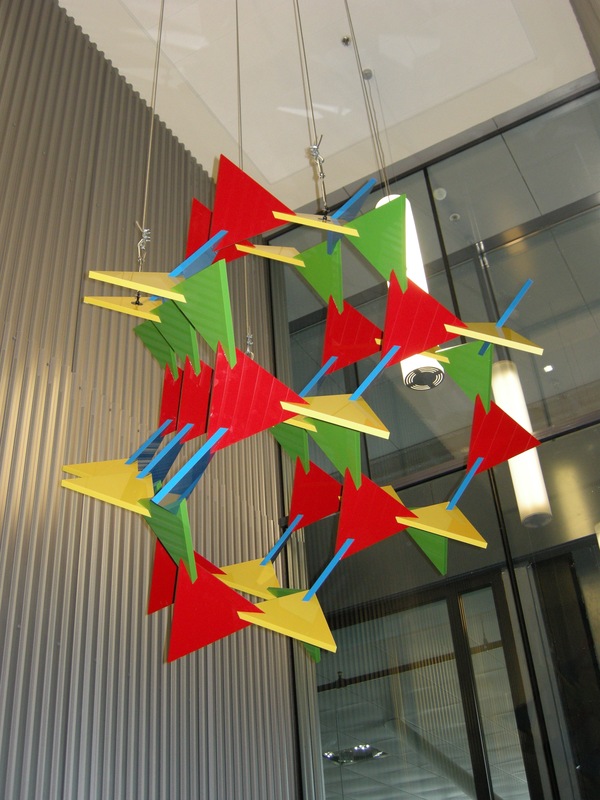 There are 15 yellow triangles, and 12 triangles of each red, green, and blue. 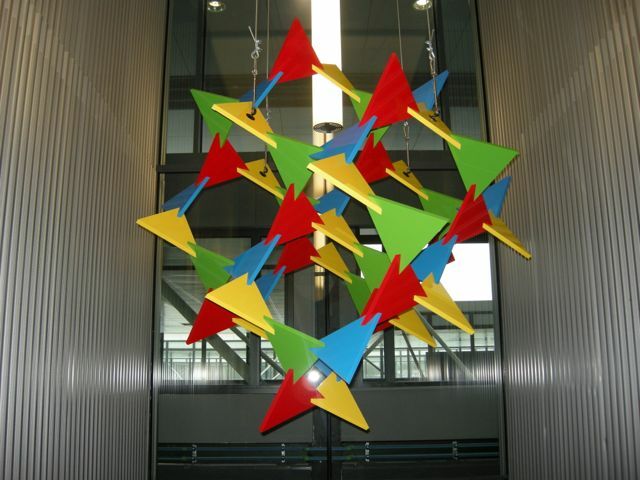 The smallest cycle involves 10 triangles. Bamboozle's structure is part of an infinite space-spanning structure with symmetry group I4332 (number 214 in the list of 230 3D space groups). This group contains rotations of order 2 (over 180 degrees) and order 3 (over 120 degrees), and also left-handed screw displacements of order 4 (over 90 degrees), and right-handed screw displacements of order 3. 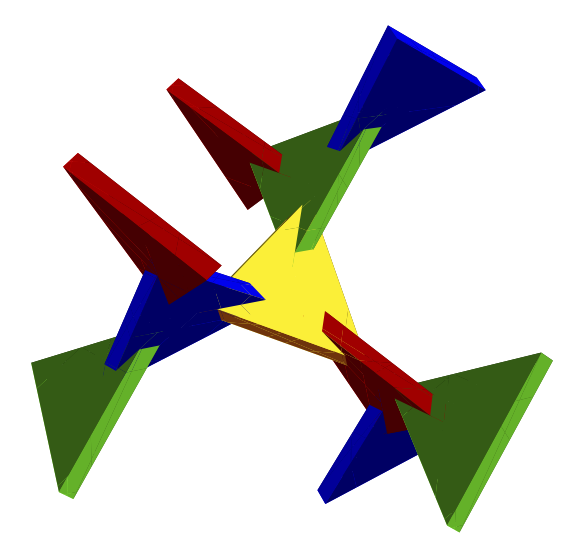 The group has no reflections; the structure is not mirror symmetric. 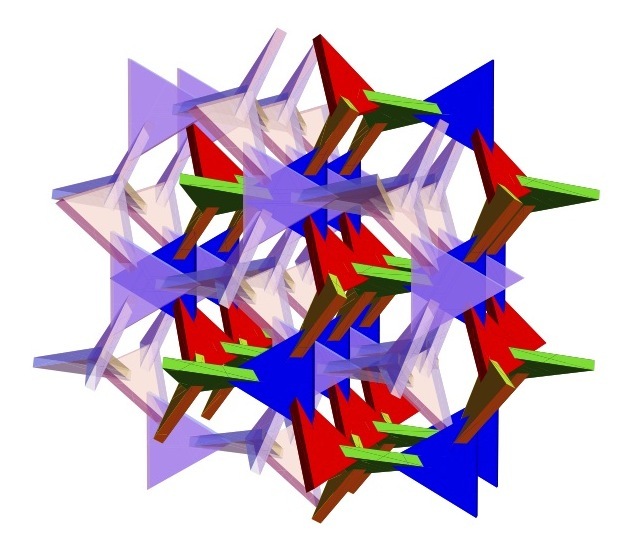 However, the empty space surrounding the triangles has the mirror image as structure (symmetry group I4132); that is, a mirror image of the structure can be nicely woven through the structure itself (see picture below). 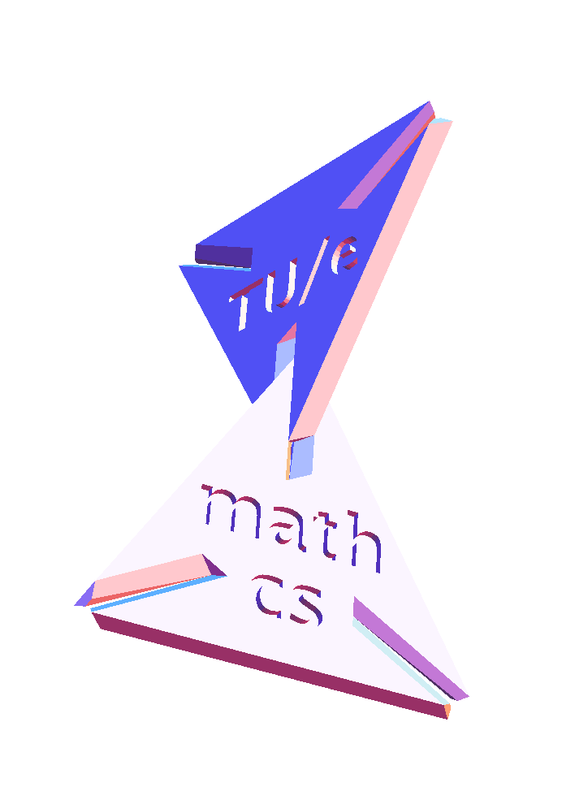 [t]he strong isotropy property states that for any two vertices V and W of the crystal, any ordering of the edges adjacent to V and any ordering of the edges adjacent to W, there is a lattice-preserving congruence taking V to W and each V-edge to the similarly ordered W-edge. 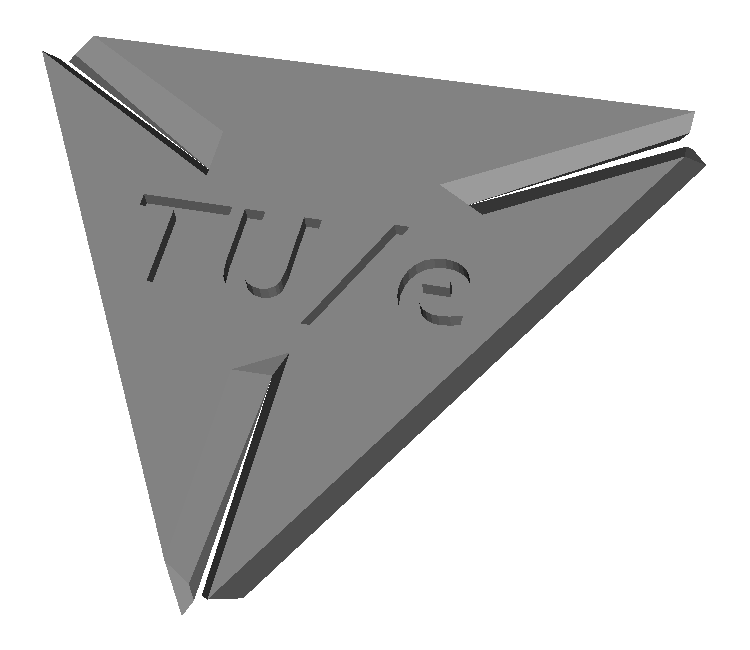 Specially designed triangles slide into each other at the appropriate angle (see figure below). With a bit of consideration, you can construct a Bamboozle from 51 slotted triangles. 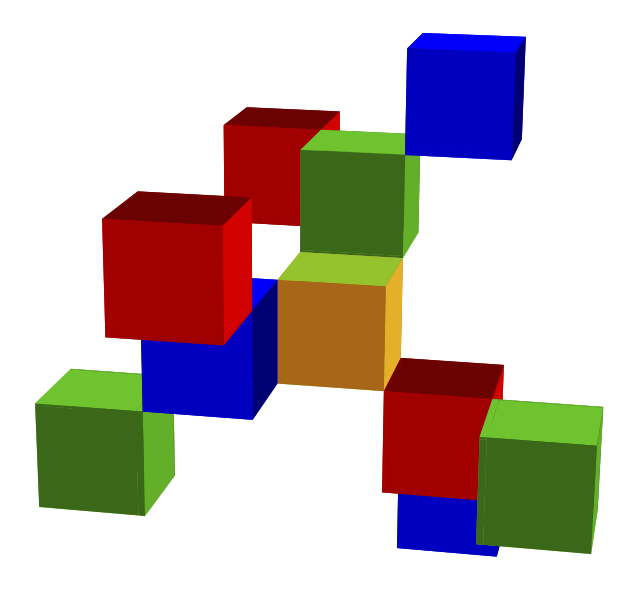 Of course, you can also put together other shapes. In [TV] we describe how Bamboozle was discovered. 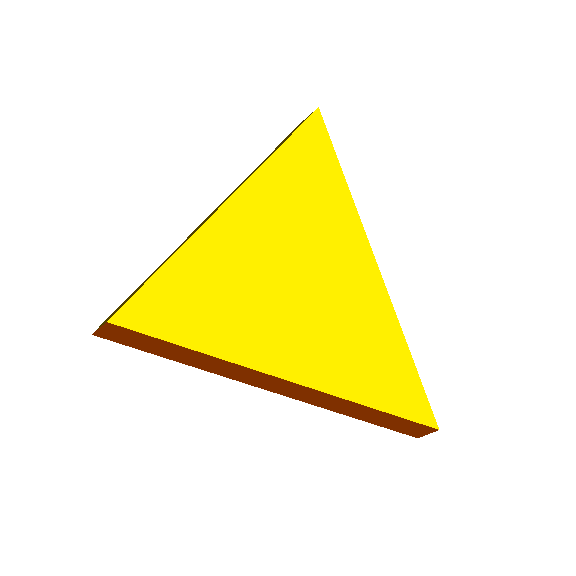 omitting, recursively, those triangles that have fewer than two neighbors. So, where does the name Bamboozle come from? 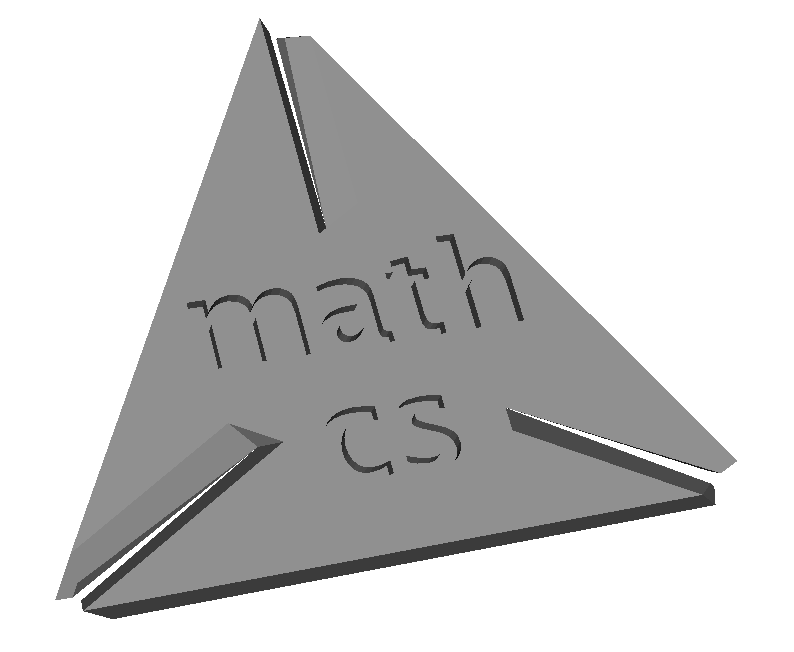 Koos Verhoeff gave this name, after we struggled some time to find out the mathematical structure. George Hart, The (10,3)-a Network. Norbine Schalij. Ingewikkelde wiskunst fleurt liftruimte op (in Dutch), Cursor on-line, 21 Jan. 2013. Nicole Testerink. Interview met Tom Verhoeff (in Dutch): "De lucht van lijm en houtzaagsel doet mij niet zoveel", Rubriek Mens, Cursor, jaargang 54, nummer 15, p.15 (5 Apr. 2012). Stephen T. Hyde, Michael O'Keeffe, and Davide M. Proserpio. "A Short History of an Elusive Yet Ubiquitous Structure in Chemistry, Materials, and Mathematics", Angewandte Chemie International Edition, Volume 47, pages 7996-8000 (2008). Tomonari Dotera. 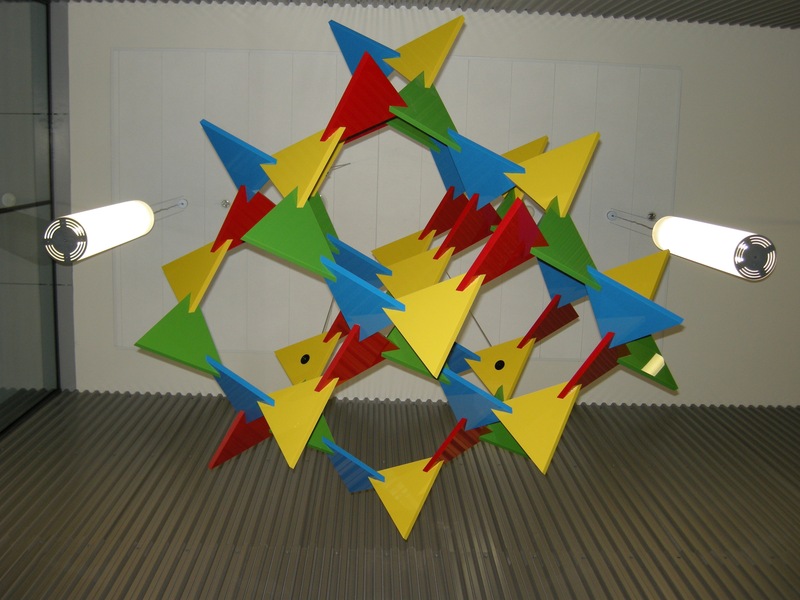 "Quest for the Gyroid Labyrinth: Geometry and Topology in Soft Matter", Journal of the Physical Society of Japan Online, News and Comments (17 Aug. 2012). Toshikazu Sunada. "Crystals That Nature Might Miss Creating", Notices of the AMS, Volume 55, Number 2, pages 208-215 (Feb. 2008). Toshikazu Sunada. Letters to the Editor, Correction: "Crystals That Nature Might Miss Creating", Notices of the AMS, Volume 55, Number 3, page 343 (Mar. 2008). Alan H. Schoen. Letters to the Editor, "On the Graph (10-3)-a", Notices of the AMS, Volume 55, Number 6, page 663 (Jun./Jul. 2008). Tom Verhoeff, Koos Verhoeff. 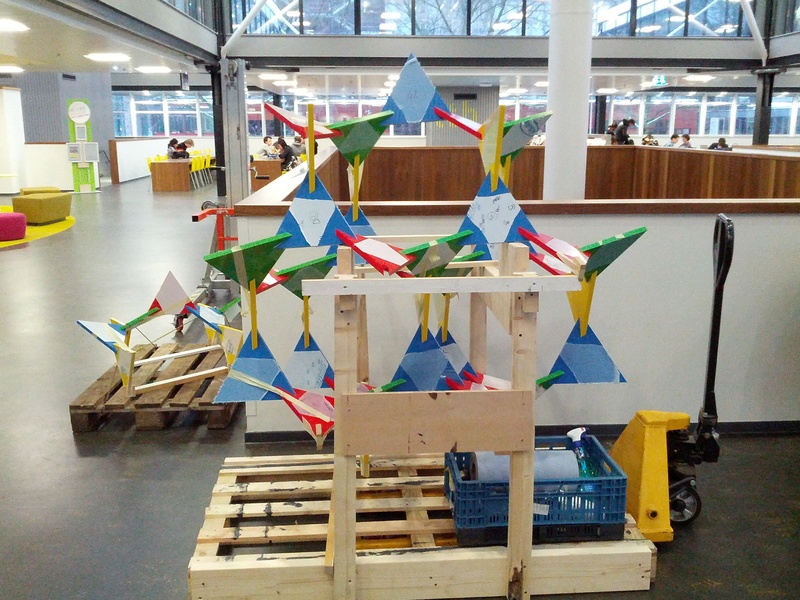 "Folded Strips of Rhombuses, and a Plea for the √2:1 Rhombus". In: George W. Hart and Reza Sarhangi (Eds. ), Proceedings of Bridges 2013: Mathematics, Music, Art, Architecture, Culture, Tessellations Publishing, ISBN 978-1-938664-06-9, pp.71-78, July 2013. 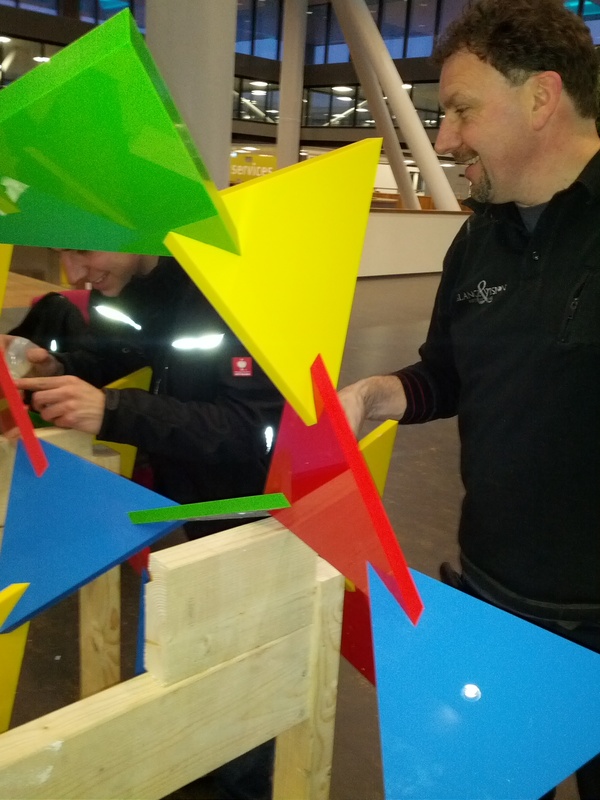 The Foundation MathArt Koos Verhoeff conserves and manages the artwork of Koos Verhoeff.